The president-elect and his transtion team must make effective use of the time between Election Day and Inauguration Day so as to "hit the ground running." Preparation for the transition begins, quietly, during the campaign. At some point, once their nominations are effectively secured, both major candidates designate people to head up transition planning. Donald Trump announced Gov. Chris Christie as chairman of his transition team on May 9, 2016 (+). Hillary Clinton formed a nonprofit 501(c)(4) Clinton-Kaine Transition Fund on Aug. 3, 2016, with John D. Podesta as president and Minyon Moore as secretary, and on Aug. 16 she announced the senior leadership term for her transition (+). Additionally, the outgoing administration starts to take steps to ensure a smooth transition. President Obama signed an executive order on "Facilitation of a Presidential Transition" on May 6, 2016 (+). After the excitement of Election Night, it is time to turn full attention to preparing to govern. The new president-elect and his transition team must make effective use of the time between Election Day and the Inauguration (+). Amid euphoria and exhaustion, responsibility looms. Expectations are high. The one-time candidate must assume a "presidential aura." Charles Jones, a visiting fellow at the Brookings Institution, has an interesting way of describing the process. He notes that the campaign is centered around one person, the candidate. After the campaign, the challenge is "attaching that person to the government." The transition requires skilled management. A certain amount of tension in this period is inevitable. People who have worked hard on the campaign now see others being brought in to manage the transition. There is much jockeying for position and resumes proliferate. With assistance from the General Services Administration, the transition sets up in an office in downtown DC well before Election Day. In the transition office the focus is on the nitty gritty of building a new administration. Careful attention is given to selecting personnel, learning about the pending issues in various agencies, and figuring out what policy initiatives to advance. In addition to the high profile White House staff and Cabinet positions myriad sub-Cabinet posts must be filled, including deputy secretaries and agency heads. (2) There is no shortage of aspirants for positions in the administration; the transition office will receive tens of thousands of resumes. There is also no shortage of advice. Every manner of constituency, interest group and a large number of interested individuals weigh in on policies and priorities for the new administration. Despite the animosity of the election campaign, the Obama Administration worked hard to ensure a smooth transition (+). On Nov. 10 President Obama and President-elect Trump met for an hour and a half in the Oval Office. On Nov. 11 Trump announced that Vice President-elect Mike Pence would serve as chairman of the Presidential Transition Team, and he announced co-chairs, executive committee and executive director (+). There was a lot of speculation about why he had replaced Christie, including some speculation that Trump's son-in-law Jared Kushner was settling scores. A week later, on Nov. 18, the transition office announced the first of the "agency landing teams" which connected with officials in various departments and agencies to facilitate the transfer of power (+). Trump largely directed transition work from Trump Tower in New York. He continued to use Twitter to great effect. On Nov. 21 he issued a short video to explain that his transition team was developing "a list of executive actions we can take on day one to restore our laws and bring back our jobs (+)." He did not hold a press conference until Jan. 11 (his previous press conference was on July 27 (>)). In terms of travel, on Dec. 1 he made a high-profile visit to the Carrier plant in Indianapolis; later that day he kicked off his "USA Thank You 2016" tour with a campaign-style rally in Cincinnati, OH (+). On Nov. 17 President-elect Trump held his first meeting with a foreign leader, sitting down with Japanese Prime Minister Shinzo Abe, and he engaged in many calls with world leaders. Trump's Dec. 2 phone call with president of Taiwan Tsai Ing-wen challenged the "one-China policy," drawing a complaint from Beijing. Trump also announced a President's Strategic and Policy Forum to hold its first meeting in early February (+). Speculation in the media about possible Cabinet picks begins even before Election Day. Throughout November and December the White House staff and Cabinet take shape. Typically the president-elect's first announcement is White House chief of staff, and the first Cabinet pick announced is either Secretary of State or Secretary of Treasury. Trump led with the controversial announcement of alt-right aligned Stephen K. Bannon to be his chief strategist and senior counselor, balanced by establishment aligned RNC chairman Reince Priebus to be his chief of staff. His first Cabinet pick, U.S. Sen. Jeff Sessions for Attorney General, provoked controversy as did a number of his other picks. Trump's selection of Secretary of State provided a bit of ongoing drama; many names were floated and the process carried on to Dec. 13, when the transition office formally announced his selection of Rex Tillerson, CEO of ExxonMobil. Overall, Trump's Cabinet picks were conservative, white, male and wealthy and included more people without government experience than in past administrations (see Building the Administration). Incoming administrations take care to avoid early flaps which can undercut their effectiveness and support. Although vetting is intense, there can be miscues, meaning there may be a nominee or two who ends up withdrawing from consideration. The 115th Congress was sworn in on January 3. Senate confirmation hearings of Cabinet nominees began in relevant committees, starting with Sen. Jeff Sessions for Attorney General on Jan. 10, although the U.S. Office of Government Ethics raised concerns that several nominees had "not completed their ethics review process [PDF]." The divisions brought out in the campaign had not gone away. In the days after the election, there were hundreds of mostly small, mostly peaceful protests around the country as well as reports in the media of increased harassment, bullying and intimidation of people of color (1, 2, PDF). Business matters rose to prominence at several points during the transition. On Nov. 18 Trump reached a settlement on lawsuits over Trump University, tweeting the next day, "I settled the Trump University lawsuit for a small fraction of the potential award because as President I have to focus on our country." In December Trump Hotels in Las Vegas and Washington reached labor agreements. On Jan. 5 at Trump Tower in New York Trump gave a deposition in the case over chef Jose Andres' decision to back out of a restaurant at the Trump International Hotel in Washington, DC. But the broader area of concern was the question of how Trump and his family would separate his business interests from governing so as to avoid conflicts of interest (PDF, 1, PDF2). On Nov. 30 Trump tweeted, "I will be holding a major news conference in New York City with my children on December 15 to discuss the fact that I will be leaving my...great business in order to fully focus on running the country..." However, on Dec. 12 he pushed the event off to "the near future." Trump finally held a "general news conference" In New York City on Jan. 11 where he addressed the issue, although not to the satisfaction of critics (+). Throughout the transition there were calls for investigations into Russian interference in the presidential election (+). A first congressional hearing took place on Jan. 5 in the U.S. Senate Committee on Armed Services, chaired by Sen. John McCain. Meanwhile on Dec. 29 President Obama announced "actions in response to Russian malicious cyber activity and harrassment." The question of whether there will be an independent commission or congressional investigation remains to be seen. Trump appeared dismiss the concerns, emphasizing that "there was absolutely no effect on the outcome of the election." Among progressives, seeds of resistance were being sown in planning for protests of the Inauguration (+). (Magazine covers told the story as well: The Nation "Mourn, Resist, Organize," Mother Jones "Rise Up," and The American Prospect "Resisting Trump"). Democrats and their allies likewise vowed to hold Trump accountable (+). The transition is not only the beginning of a new administration, but the end of an old one. Handing over the reins of power requires considerable preparation on the side of the outgoing administration. The new team must be briefed; records must be boxed and filed. During its waning days, the outgoing administration will also endeavor to get as much done as possible, attempting to produce some last accomplishments to add to its legacy and making a final round of appointments, executive orders, regulations, and pardons. President Obama gave his farewell address in Chicago on Jan. 10, discussing "the state of our democracy" and a number of threats to it and declaring himself "even more optimistic about this country than when we started" (+). Much attention is given to the first 100 days. One hundred is a nice round mumber, but it is arbitrary. The original first 100 days refers to the start of President Franklin Delano Roosevelt's tenure in 1933 during the Great Depression (>), and 100 days continues to be used as a convenient marker to measure a president's early progress. Just as one cannot judge how a runner will perform in a marathon from the first two miles, one should not draw too many conclusions about a term of 1,461 days from the first 100 days. Six months provides a better marker. Nonetheless the early actions of a new administration are fraught with symbolism and can give a sense of how it will operate. As with his predecessors, Trump has used executive orders and presidential memoranda to get his administration off to a start (+) and to fulfill campaign promises. Some of these have been quite controversial, most notably the immigration ban he signed on Jan. 27 and re-issued in revised form on March 6. Trump's nomination of Neil Gorsuch to the Supreme Court was greeted warmly by his supporters. Trump's Cabinet picks were confirmed without too much trouble, but there were a few exceptions. The most contentious of his nominees were Andy Puzder, who eventually withdrew from consideration as Secretary of Labor, Betsy DeVos as Secretary of Education, and Scott Pruitt as EPA Administrator. USTR nominee Robert Lighthizer was the final Cabinet nominee approved, on May 11. Each nominee has a team to guide him or her through the confirmation process; there are policy, legal, press and congressional affairs aspects to consider. Traditionally the Senate will not block a nominee unless he or she has ethical problems or is not qualified. While the nominees go through the confirmation process, the work of the departments and agencies goes on under the direction of acting secretaries and leadership (PDF). The Cabinet is only a small part of the work of building an administration (1, 2). All told, according to the Partnership for Public Service, there are about 4,100 positions to fill, including roughly 1,200 positions requiring Senate confirmation. From the outset the new administration had an antagonistic relationship with mainstream media. At his Jan. 12 press conference Trump dismissed CNN as "fake news." On Jan. 22 senior advisor Kellyanne Conway coined the term "alternative facts" while defending press secretary Sean Spicer. Senior advisor Steve Bannon declared in an interview that, "The media here is the opposition party. They don’t understand this country. They still do not understand why Donald Trump is the president of the United States." Speaking at CPAC on Feb. 24, Bannon described a "corporatist, globalist media that are adamantly opposed, adamantly opposed to an economic nationalist agenda like Donald Trump has." First Day - Jan. 20: Between the Inaugural Parade and Balls, President Trump signed an executive order "Minimizing the Economic Burden of the Patient Protection and Affordable Care Act Pending Repeal," and he signed commissions of Mattis as Defense Secretary and Kelly as Homeland Security Secretary (they were confirmed earlier by the Senate, and sworn in later by Vice President Pence). Chief of staff Priebus issued a memo ordering an immediate regulatory freeze. First Trip - Jan. 21: Trump visited CIA headquarters in Langley, VA, where he spoke for about 15 minutes to 400 employees. First Meeting with a Foreign Leader - Jan. 27: Trump met with British Prime Minister Teresa May in Washington. First Week - The Administration touted a "week of action" including 15 presidential actions directed towards fulfilling campaign promises (+). However, critics found much to criticize, whether it was Trump's seeming preoccupation with size of the crowd at his inauguration or his call for a major investigation into voter fraud based on the thinnest of evidence or his controversial executive order on refugees. First Combat Operation - Jan. 29: Trump ordered a raid in the Yakla region of Yemen, targeting al-Qaeda in the Arabian Peninsula. Many questions were raised about both the planning and the outcome of the raid, which cost the life of U.S. Navy SEAL William "Ryan" Owens as well as lives of Yemeni civilians. Trump went to Dover AFP for the arrival of Owens' remains on Feb. 1, and highlighted Owens' sacrifice in his Feb. 28 speech to Congress. First Supreme Court Nomination - Jan. 31: Following the death of Supreme Court Justice Antonin Scalia in Feb. 2016, President Obama had on Mar. 26 nominated Judge Merrick Garland. However, Senate Republicans sat on the nomination, leaving an opening for President Trump. Indeed filling Supreme Court vacancies was one of the issues that helped tip the election to Trump. On Jan. 31 Trump announced his pick of Judge Neil Gorsuch, setting off a contentious confirmation battle (+). First Solo News Conference - Feb. 16: Trump announced Alexander Acosta as his new pick for Labor Secretary and took questions (>). He again lambasted the media and declared his administration "is running like a fine-tuned machine." First Address to Joint Session of Congress - Feb. 28: Observers generally lauded Trump's hour-long address for its conventional tone. "What we are witnessing today is the renewal of the American spirit," Trump declared, "Our allies will find that America is once again ready to lead (+)." First Big Legislative Battle: The American Health Care Act (AHCA), a House bill to repeal and replace Obamacare, marked a key test for Republicans, who have sought for years to repeal the Affordable Care Act. While Trump and Speaker Ryan worked hard to move the legislation, labeled by some as "Trumpcare," members of the House Freedom Caucus and conservatives were skeptical of "Obamacare lite." The vote was initially set for Mar. 23 and then postponed to Mar. 24. On the afternoon of Mar. 24, shortly before the vote was to occur, Ryan pulled the bill (+, *). While news organizations ran many critical stories about Trump and his administration during the first 100 days, during that same time, through appointments and lack of appointments, executive orders, and memoranda, the administration was making strides toward what senior advisor Steve Bannon termed in Feb. 24 remarks at CPAC "deconstruction of the administrative state." 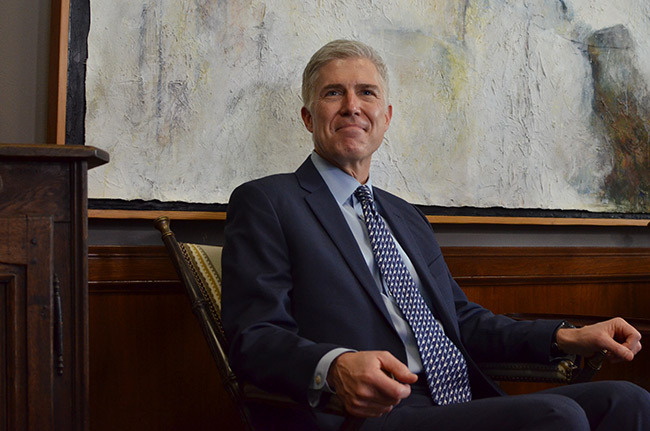 High on Trump's accomplishments was the confirmation of Neil Gorsuch as an Associate Justice of the Supreme Court approved in a Senate's vote on April 7. The Senate Judiciary Committee held four days of hearings, Mar. 20-23 (>), then voted on April 3 in a party line vote, 11 to 9, to send the nomination on to the full Senate. Democrats mounted a filibuster, but Republicans turned to the so-called "nuclear option," requiring only a simple majority to break the filibuster and approve the nomination. Repeal and replacement of the Affordable Care Act (Obamacare) proved to be a more complicated challenge for the administration due to divisions among congressional Republicans. Other setbacks came as federal judges blocked executive orders on a travel ban and sanctuary citles. Nonetheless the administration plowed ahead with its agenda. On April 26, with the 100 day milestone fast approaching, the administration announced a "massive tax cut" proposal or tax reform principles, but this was thin on detail and its prospects uncertain (+). On the international front, one of the biggest developments of Trump's first 100 days was his decision on April 6 to order a missile strike in Syria following a chemical weapons attack there (+). Also in April the U.S. dropped the "mother of all bombs" on Afghanistan. Heightened tensions with North Korea loomed as a potential trouble spot. Questions about Russian interference in the 2016 presidential election continued to dog the Trump Administration during its first hundred days, allthough Trump dismissed the matter as "a ruse" and congressional investigations seemed to be making little headway (+). Trump's proclivity for setting off controversies and distractions continued. For example on March 4 he tweeted, "Terrible! Just found out that Obama had my 'wires tapped' in Trump Tower just before the victory. Nothing found. This is McCarthyism!" However, he provided no evidence. Media and pundits ran with this story for weeks. There were reports of bitter infighting in the administration, Trump's job approval ratings were abysmal (>), and critics continued to raise questions about conflicts of interest and whether Trump and his family were profiting from his presidency (+). Opponents ("the resistance") continued to organize and protest. Any hopes that Trump, as an outsider, might be able to break the gridlock on Capitol Hill quickly fell by the wayside (+). Trump's supporters largely continued to back him, although a number of articles appeared suggesting he was straying from the populist and non-interventionist themes he espoused during his campaign. In his weekly radio address Trump termed his first 100 days "just about the most successful in our country’s history" stating that, "In just fourteen weeks my administration has brought profound change to Washington (+)." However, many media reviews were scathing. Matt Bai characterized the administration as "Team of Amateurs" and the New Yorker's John Cassidy wrote that "it often looks like the Keystone Kops are in charge." The Washington Post tallied 488 false or misleading claims by Trump in his first 100 days (>). Writing in the Weekly Standard, Michael Warren described an "ad hoc presidency." Typically the leadership of both national party committees changes after a presidential election. The president-elect will select the chairman of his or her party. For the losing side, a number of hopefuls compete to rebuild the party, and there is much discussion about how to move beyond the recent defeat. In December 2012, RNC chairman Reince Priebus announced a Growth & Opportunity Project "to grow the Republican Party and improve future Republican campaigns." A 98-page report containing 219 recommendations was released on March 18, 2013 (+). 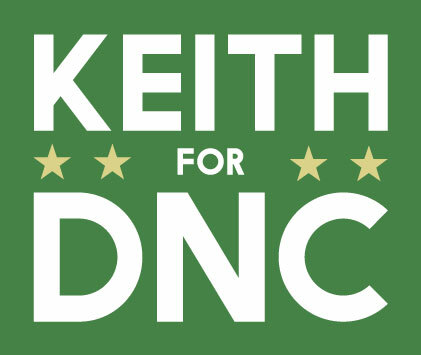 - U.S. Rep. Keith Ellison (MN) started his campaign early and appeared to be the favorite. He gained the support of such progressive luminaries as Sen. Elizabeth Warren (MA) and Sen. Bernie Sanders (I-VT), the backing of the AFL-CIO and other unions, and tallied numerous endorsements (+). - U.S. Secretary of Labor Tom Perez announced his candidacy on Dec. 15. Perez was seen as President Obama's choice. He described himself as a "turnaround specialist" and emphasized that "most of all, we need to listen (+)." - Idaho Democratic Party executive director Sally Boynton Brown announced her candidacy on Dec. 16, seeking to build "a resilient, innovative Party for the 21st century." She is president of the Association of State Democratic Party Executive Directors (ASDED) (+). - South Bend Mayor Pete Buttigieg offered a "fresh start," declaring "the solutions for our party won't come from Washington, they'll come from our communities." Buttigieg announced on Jan. 5. He is a Rhodes scholar, Afghanistan veteran, and gay and is still under 40 years old (+). - Jehmu Greene, whose experience includes serving as president of Rock the Vote from 2000-05 and a political analyst on the FOX News Channel since 2010, was the final entrant in the field and said she would be a "fierce messenger" for the party. Former Gov. Howard Dean was in the running for a short time but ended his bid on Dec. 2. Former Gov. Martin O'Malley and NARAL Pro-Choice America president Ilyse Hogue also looked at running but ruled it out. The rules and procedures for the election [PDF] were set by the DNC Rules and Bylaws Committee at their meeting in Denver, CO on Dec. 1-3, 2016. A series of forums was held, and the election itself took place at the DNC winter meeting in Atlanta, GA on Feb. 25, 2017 [PDF]. Tom Perez came up just short on the first ballot ahead of Keith Ellison, and then won on the second ballot (+). At the meeting there was also heated debate over a resolution to ban contributions from corporate PACs. None of the party officers is a straight white male and early signs are the party is continuing its emphasis on diversity (+). Another issue for Democrats is the question of super-delegates; the DNC Rules Committee, meeting in July 2016 during the Democratic National Convention, established a "unity commission" which will address that point and possibly other issues. The party announced the 21 members of the Commision on April 17 (+). Meanwhile, the RNC named its leadership for 2017 as Michigan Republican Party chairwoman Ronna McDaniel and Trump for President Ohio state director Bob Paduchik (+). Additionally on Jan. 12, 2017 Trump announced a small leadership team for his re-election campaign (+), and on Jan. 20 he filed a Form 2 with the FEC. The campaign did not stop (+). Also in January several outside groups took up the task of supporting President Trump's agenda. Great America Alliance grew out of a super PAC that was active during the campaign (+), while on Jan. 30 Trump-Pence leaders launched another group, America First Policies (+). 1. On Oct. 16, 2010, President Obama signed into law S.3196, the Pre-Election Presidential Transition Act of 2010, providing for the General Service Administration to provide for transition planning resources starting after the nominating conventions. Sen. Ted Kaufman (D-DE) and several other Senators introduced the bill in April 2010 (+), based on recommendations in a report from the Partnership for Public Service. 2. On Aug. 10, 2012, President Obama signed into law S.679, the Presidential Appointment Efficiency and Streamlining Act of 2011, which reduces the number of executive positions subject to Senate confirmation. Chris Cillizza. There are at least 22 Democrats thinking about running for president in 2020. CNN, May 2, 2016. Perry Bacon Jr. and Dhrumil Mehta. "The 7 Signs That Someone Might Be Running For President In 2020." FiveThirtyEight, May 8, 2016. Lisa Hagen. "The 43 people who might run against Trump in 2020." The Hill, May 8, 2016. Martha Joynt Kumar. May 2015. BEFORE THE OATH: How George W. Bush and Barack Obama Managed a Transfer of Power. Baltimore, MD: Johns Hopkins University Press. Christopher Liddell, Daniel Kroese and Clark Campbell. May 1, 2013. ROMNEY READINESS PROJECT 2012: Retrospective & Lessons Learned. R2P, Inc..
--. Jan. 13, 2010. READY TO GOVERN: Improving the Presidential Transition. Washington, DC: Partnership for Public Service. Anne Joseph O’Connell. Jan. 15, 2009. LET'S GET IT STARTED: What President-Elect Obama Can Learn from Previous Administrations in Making Political Appointments. Washington, DC: Center for American Progress. Stephen Hess. Nov. 2008. WHAT DO WE DO NOW? : A Workbook for the President-elect. Washington, DC: Brookings Institution Press. L. Elaine Halchin. Nov. 25, 2008 update. "PRESIDENTIAL TRANSITIONS: Issues Involving Outgoing and Incoming Administrations." Washington, DC: Congressional Research Service. U.S. Senate. Sept. 10, 2008. "Managing the Challenges of the Federal Government Transition." Hearing before the U.S. Senate Committee on Homeland Security and Governmental Affairs, Subcommittee on Oversight of Government Management, the Federal Workforce, and the District of Columbia. U.S. General Accountability Office. June 2002. THE WHITE HOUSE: Allegations of Damage During the 2001 Presidential Transition (GAO-02-360). Martha Joynt Kumar and Terry Sullivan , eds. Feb. 2003. THE WHITE HOUSE WORLD: Transitions, Organization, and Office Operations (Joseph V. Hughes, Jr., and Holly O. Hughes Series in the Presidency and Leadership Studies, No. 13). Texas A&M University Press. Richard E. Neustadt. Oct. 2000. PREPARING TO BE PRESIDENT: The Memos of Richard E. Neustadt. AEI Press. John P. Burke. Sept. 2000. PRESIDENTIAL TRANSITIONS: From Politics to Practice. Lynne Rienner Publishers. Carl M. Brauer. Dec. 1988. PRESIDENTIAL TRANSITIONS: Eisenhower through Reagan. Oxford University Press. Copyright © 2014, 2015, 2016, 2017 Eric M. Appleman/Democracy in Action. All rights reserved.